When I tell people I am a bow and arrow bird hunter they usually assume I play the video game. Nope, I really hunt birds with the bow. I get a lot of strange looks when I meet other bird hunters in the woods. A lot of those guys have laughed until I pulled a few woodcock or a grouse from my game vest. As a bow and arrow bird hunter I use a Hoyt Buffalo recurve bow, and shoot flu flu arrows tipped with Snaros. 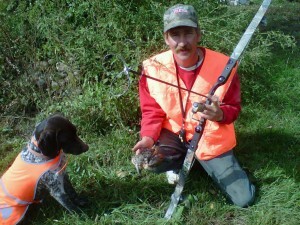 While I have both flushing and pointing dogs the pointer is a necessity when I’m bow hunting the birds. With the pointing dog I am ready for the bird to flush and often can even reposition for the most clear path for my arrow. 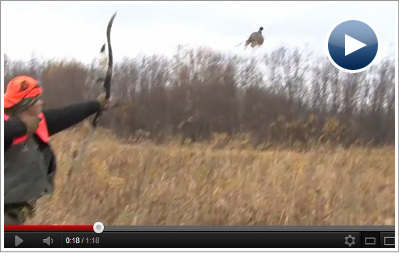 Also important for the bow and arrow bird hunter is practice on aerial targets. I go to Birdseye View in Wisconsin 906 221 0783 and get to practice on quail and chukar partridge. Both hold well on point and are great practice for me and my dog.